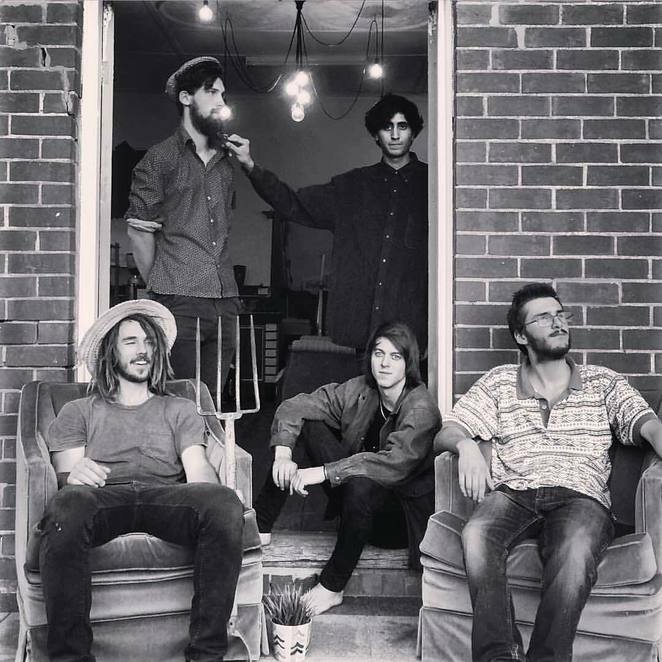 Winter may be upon us, but a five-piece outfit who go by the name of The Winter Gypsy will be heating up the coast with their tour set to kick off late-August. You may be familiar with their single Took Me By, which has been getting some serious play on Rage each Saturday morning or by Triple J who have showed the band a bit o' love. It's been pretty good, we've just mainly had our mates help us out coming to our shows – we've only been a band for less than year! We played our first gig in August last year and that was a lot of fun. We've just kind of progressively grown in number of people coming to our shows locally which is great to see – people showing their faces to some local talent. It has only been pretty recently – since we released the single – that we have been getting more recognition. Not just from the track we released, people are really getting around it which is really good to see. I think the only person I didn't know was Jonny our guitarist, but Max ... there was just all these connections from people who just wanted to play music. Me, Dave and Isaac – my bassist and piano player, we've been jamming since 2012, we've just been in different bands, doing different stuff, solo stuff and, now we've just kind of merged into this one band. Dave and I used to jam backyard shows. We would organise these shows, hang out ... I think it was the way we jammed – we had our shoes off, on the piano, xylophone, melodica, random instruments that Dave and I would harmonise, and made it real fun, a real fun experience. People said we just looked like gypsies, ripped jeans, just having some good fun! How did you come up with The Winter Gypsy? That word kind of stuck with me, because a few of mates were kind of calling me that. I just thought hmmm, I just can't get it out of my head. It was during winter and winter is my favourite season and then it just hit me, The Winter Gypsy … I am The Winter Gypsy! I kept it in my head, until about 2014-15. I had the name in my head for about a year, and never started the project until I met Max. Canberra is our second home, so we'll be spending the weekend in Canberra. I am pretty psyched about it. Honestly, I think we are keen to travel. I've never really been to Sydney, I've only been to Melbourne for about 10 days. It'd be good to travel with the guys because we all work so well together and we are pretty much a family. Go on like a family trip - treat it like a holiday. We've done it before (driving) we just did a Canberra show. That was a lot of fun, we just treated it like a holiday. It was good to get the boys back in the van! Lyrics and life in the band. I write the majority, I just write it on my guitar and then add the lyrics to it. I bring it to the band and they figure it all out really quickly. It turns from a folk tune, a real mellow, soft tune to a huge driven song with a guitar solo or heavy drum beat and it really merges really well. It is really cool, it ends up sounding really good. In all our different bands we played different music. Max is a real rock genre, he loves it. Jonny our lead guitarist is a progressive rock player, he plays a lot of long instrumentals, which I really love as well. We kind of bring it all to the table and I just lay it all out and we kind've come up with the songs within one jam and, we are like wow, this is really cool. We fine tune it and it works out really well, I don't have to tell them what to do. I am grateful for the boys being so in tune, because I sure as hell am not! Is it true you are a self-taught musician? I can't read any music, I do everything by ear. I've now played guitar for five years, and I did teach myself, I don't really know intricate things, I don't even know the chords or anything of what I am playing – they(band) know what I am playing (band). I've never been able to do it (write and read sheet music). Someone like Sean our trumpet player, has been studying music for years, he says to meet someone like me is fascinating! He really loves the challenges I bring to the table, he says it is really cool – keep doing it, haha. It is a lot of fun, I love the challenge and not knowing what everything sounds like. It takes me a long time to write a song because I do everything by memory. I keep getting told by Jonny and Sean that I should go and study it. Indie-folk music, hype or here to stay? I honestly haven't really been following the hype (popularity of indie-folk), I think it's because I have been into Indie folk for a long time, it is what I dive into all the time. I am not too sure if it has dropped off a little bit. I see bands like The Paper Kites and The Middle East – they haven't been a band for a few years now and they still get mentioned. I don't know ... I am also massively influenced by Bon Iver. They are not really the type of band that constantly goes on tour, I feel that is my kind of vibe as well. I really enjoy putting out tracks, as opposed to doing heaps and heaps of gigs. It is what you gotta do when you start out, you really gotta go for it, I really enjoy the recording part of it as well. The love from Triple J and Rage. Oh absolutely, I heard myself on the radio for the first time ... it was amazing. I couldn't stop smiling, it was probably one of the greatest moments in ages. Just me trying to process that it was real, so surreal, ahhhhh! I was on the phone to my bass player at the time and we were just screaming on the phone, maybe it was just me screaming on the phone! Listening to the whole song I remembered wanting to be on the radio,it was like a joke, one day I will get on the radio – everyone on the planet says that and we are on the radio – national radio, it is a great thing. It's been less than a year and we are kicking down doors, just wanting to be heard. I am super, super happy, thankful we have done what we have done in such a short time (pauses) I'm just thinking of the Triple J thing, what a moment!